Nadège Marchal received a Master degree in Chemistry with a specialization in Chemistry of Materials from the Université de Mons in 2017. 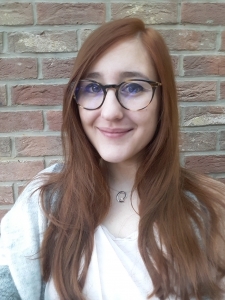 She did her Master thesis in the Laboratory of Chemistry of Novel Materials, on the theoretical study of the structural and electronic properties of lanthanide titanates, a new family of oxides for photovoltaic applications, under the supervision of Prof. David Beljonne and Prof. Roberto Lazzaroni. She started as a PhD student in 2018, in the same group, under the supervision of Prof. David Beljonne and Dr. Claudio Quarti. Her research topic is: “Modeling of 2D hybrid perovskites for optoelectronic applications” and aims at understanding and improving the optoelectronic properties of 2D hybrid perovskites with different components. In 2019, she joins the group of Prof. Filippo De Angelis at the Università degli Studi di Perugia, for one year and a half, in the context of a shared PhD.